Chief Justice Khosa’s allegiance to the Bajwa doctrine can spell fresh crisis for Pakistan. Last week, Pakistan’s Supreme Court got a new chief justice, Asif Saeed Khosa, but soon after the top judge took oath, he showed signs that he won’t be any different from his predecessors when it comes to rooting for the military. The 26th chief justice of Pakistan indicated, at the farewell ceremony of outgoing chief justice Mian Saqib Nisar, that he too would follow the ‘Bajwa Doctrine’, a proposed move to limit the financial autonomy of Pakistan’s provinces. Chief Justice Khosa’s allegiance to the doctrine – in his short tenure, which will end 20 December 2019 – may spell fresh crisis for Pakistan. In March 2018, a few select journalists were invited to speak to Pakistan Army chief General Qamar Javed Bajwa in an unconventional briefing. It was reported that General Bajwa wanted to do away with the 18th Amendment, passed unanimously by Pakistan’s national assembly in 2010, and bring in a more centralised system of governance. Striking down the devolution of powers for provinces, this move would make federal authorities the sole in-charge, especially when it comes to allocation of financial resources. General Bajwa believes that Pakistan owes its current economic downturn to provinces that are drawing too much money, and therefore forcing curbs on military spending. So, the reversal of this amendment would also mean that the military will get an even bigger share from the federal budget. Previous chief justices of Pakistan have been unable to do much when it comes to keeping a check on military power. In a recent hearing before his retirement, Chief Justice Nisar asked why the 18th Amendment was passed without a parliamentary debate. His argument is fallacious because there were several rounds of deliberations before parliament approved the amendment. He proposed that he would hold an inter-institutional dialogue, but worryingly suggested that the President of Pakistan should convene and chair this meeting that should be attended by the top parliamentary leadership, the top judicial leadership and the top executive leadership, including the military and intelligence agencies. This is quite alarming given that Pakistan is a parliamentary system where the power lies with the Prime Minister. What is more, Chief Justice Khosa suggested the gathering come up with a Charter of Governance—even though as per the Constitution, the onus lies on the parliament and provincial governments. But such centralisation of power is anti-democratic and must be discouraged. However, there is little chance of that happening since the central government’s spokesperson has already welcomed this controversial proposal by the new chief justice. This is perhaps because the new government enjoys a thin majority in parliament and cannot reverse the 18th Amendment on its own. It may need an alternative platform of governance to do so. The chief justice calling for a parallel governance structure only furthers the popular belief in Pakistan’s power circles that most of the economic woes the country faces today are due to provincial autonomy. Chief Justice Khosa is undoubtedly taking a cue from General Bajwa’s words. Pakistan’s financial troubles can’t be entirely attributed to provincial autonomy. In fact, it has brought more democratic sustainability in the country. But it appears that once again Pakistan’s institutions do not want to operate within the constitutional framework. This has resulted in ordinary citizens being controlled by a handful of non-democratic forces. It is time the country’s judiciary stopped this practice and instead focused on what it is meant to do: dispense justice. There is currently a backlog of more than 1.8 million cases in courts across the country. Pakistani citizens can be served better if judges focused on clearing pending cases instead of introducing non-democratic structures to run the country – for which they have no mandate. 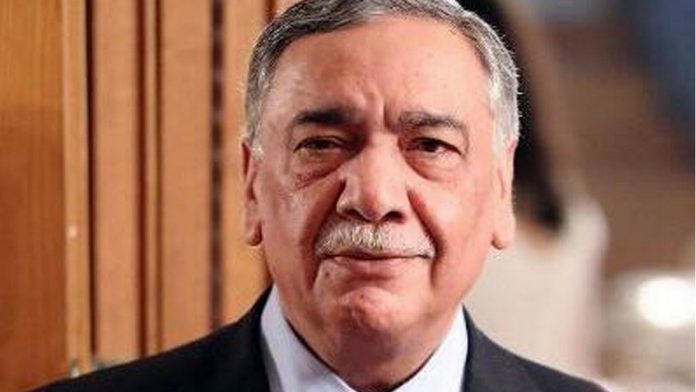 Chief Justice Khosa takes over from Mian Saqib Nisar, who was criticised by most of the legal fraternity for his celebrity ways as he encroached upon everything legislative and executive. Chief Justice Nisar also opted to be a tool used by the Pakistan military to settle political scores as witnessed in the case of former Prime Minister Nawaz Sharif, who was removed over trumped up charges and is currently in jail. It is widely believed that Sharif is being punished for challenging the military. However, it was a relief to hear Justice Khosa’s speech at the full-court reference in honour of the outgoing chief justice. The new chief justice announced that judicial activism in the form of suo motu notices would be used ‘very sparingly’. Nisar, his predecessor, was criticised for issuing too many suo motos – which allow the courts to intervene in public interest matters – on frivolous issues, for the sake of self-promotion. It is welcome to see that the highest office-bearer in the judiciary is willing to reassess his role in trying to ‘save’ the country through ‘activism’ and by correcting the wrongs, real or perceived, committed by the executive. Chief Justice Khosa also boldly spoke on the issue of missing persons. He said enforced disappearances – allegedly carried out by the Pakistan Army – must be addressed. He denounced it as being ‘offensive to the constitutionally guaranteed fundamental rights to life and liberty’. And so the big question for Chief Justice Khosa is: will he or will he not let governance prevail over the army? The author is an award-winning Pakistani journalist living in exile in France. He teaches journalism and is writing a book on Pakistan. He also manages safenewsrooms.org, a digital media platform documenting press censorship in South Asia. He tweets @TahaSSiddiqui. The crocodile has become too large for the pond, is threatening the entire eco system. If the army was really such a fine, nationalist institution, all that stands between Pakistan and external threats / internal chaos / venal politicians, considering that it was directly in charge for so long and still has a veto right over much of what civilian governments do, how come Pakistan is in such a mess, living partly on the generosity of rich cousins. The best any CJP can do is to steadily improve the working of the judiciary, afford relief to ordinary citizens, understand what the limits to his power are, not cross the army’s red lines. That would also be the remit of the Prime Minister. Uprooting this monstrous tree will not be easy.